1. Our temperature loggers are tested at point of manufacture to make sure they meet the specification. This is the Quality Control (QC) and Quality Assurance (QA) aspects of manufacturing. The testing is traceable back to NIST which is the US version of NATA. 2. All units that are sold are consequently within the accuracy specified. This isn’t because they have been tested by us or an independent lab, but by the manufacturer. 3. Certification is the testing to see how close the readings are to the true temperature. 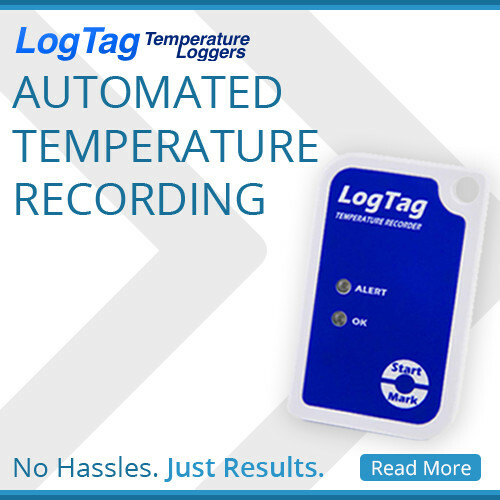 With the Logtag temperature loggers and many of the Thermocron temperature logger models we are able to supply a manufacturer’s certificate of compliance (for Logtag) or a standard certificate generated by eTemperature showing the manufacturing test results. In both cases, they are only really stating that at the time of manufacture, the devices were within specification. 3. In some industries an independent validation of this is required, hence the NATA certificates. NATA certification is done by an independent lab and their equipment is tested by NATA. We use an independent NATA lab to get the certificates. The prices are same even if it is a $60 logger or a $6,000 logger. We have no control over it, and find it odd that a piece of paper costs more than our loggers. 4. A NATA certificate really only states that the equipment had a specified accuracy (inaccuracy!!!) at that time. Practically, however, there is normally a recertification date associated with the certificate. This is typically 12 months. It is normally determined by the application, and not by the actual reliability of the specific equipment. 5. From experience, modern temperature loggers like the Thermocrons and Logtag don’t drift with time like analog equipment used to drift. So a device that is half way through its life cycle will have the same results as it did when it was brand new. 6. There are environmental factors that can compromise the unit such as being dropped, very excessive temperatures, static etc. So there is no way that anyone can guarantee the life time accuracy of the device, and hence the recertification requirements with NATA. 7. With vaccine fridges, the unit is validating what is happening in the fridge. Since a vaccine fridge has a temperature display and alarms, it is validating what the fridge is telling the user. If the fridge says everything is good, and the logger says everything is good then chances are everything is good. 8. If you fridge and logger are reporting a problem then there is obviously a problem. 9. If the fridge is reporting a minor problem but the logger doesn’t then everything is still fine, but possibly do a minor change to either the fridge, or the staff procedures, or ensure they shut the door! 10. But if the logger is reporting problems and the fridge isn’t, then feel free to question the accuracy of the logger. We will typically supply a second logger to have two side by side. Whenever we have done this, the results have been correct and the fridge has needed adjusting. We know that a logger placed randomly in the fridge will have a different reading to a fixed sensor in a different location. 11. Calibration is the adjustment of readings to bring them closer to the true temperature. We certify units, not calibrate them. That is, we test the units to see what the reading is compared with the true temperature. Since it is typically within the specified accuracy then the unit is passed. IF it was outside the accuracy we would replace it. 12. We do not calibrate (i.e. adjust) the readings to bring them within range. 13. While it is possible to calibrate the units, we actively chose to not support this option. If the unit has drifted outside its accuracy then chances are it is failing, and should be replaced. but chances are the question is meant to be “can the units be NATA certified?” in which case the answer is “yes”. Then the next question is “do we need to get it NATA certified?” for which we mumble an answer about it all depends and you need to check and we can’t give a definitive answer. What we do know is that most people don’t. Or putting it slightly differently “can we get away with the manufacturer’s certificates?” and most people seem to answer the question themselves with “yes”. And for those who do get a NATA certificate the question is “how often do I need to get it recertified?” and by now you should be able to predict the shuffling of feet. Part of the problem isn’t to do with what is required by law, but by the auditor. And that is one thing we can’t predict.